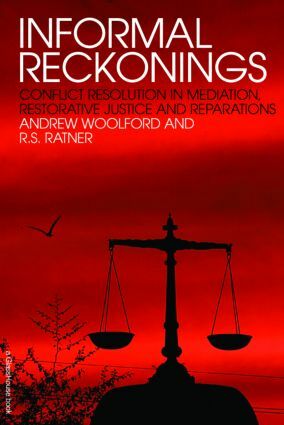 The 'reparational turn' in the field of law has resulted in the increased use of so-called 'informal' approaches to conflict resolution, including primarily the three mechanisms considered in this book: mediation, restorative justice and reparations. While proponents of these mechanisms have acclaimed their communicative and democratic promise, critics have charged that mediation, restorative justice and reparations all potentially serve as means for encouraging citizens to internalize and mimic the rationalities of governance. Indeed, the critics suggest that informal justice's supposed oppositional relationship to formal justice is, at base, a mutually reinforcing one, in which each system relies on the other for its effective operation, rather than the two being locked in a struggle for dominance. This book contributes to the discussion of the confluence of informal and formal justice by providing a clearer picture of the justice 'field' through the notion of the 'informal/formal justice complex.' This term, adapted from Garland and Sparks (2000), describes a cultural formation in which adversarial/punitive and conciliatory/restorative justice forms coexist in relative harmony despite their apparent contradictions. Situating this complex within the context of neoliberalism, this book identifies the points of rupture in the informal/formal justice complex to pinpoint how and where a truly alternative and 'transformative' justice (i.e. a justice that challenges and counters the hegemony of formal legal practices, opening the field of law to a broader array of actors and ideas) might be established through the tools of mediation, restorative justice and reparations.